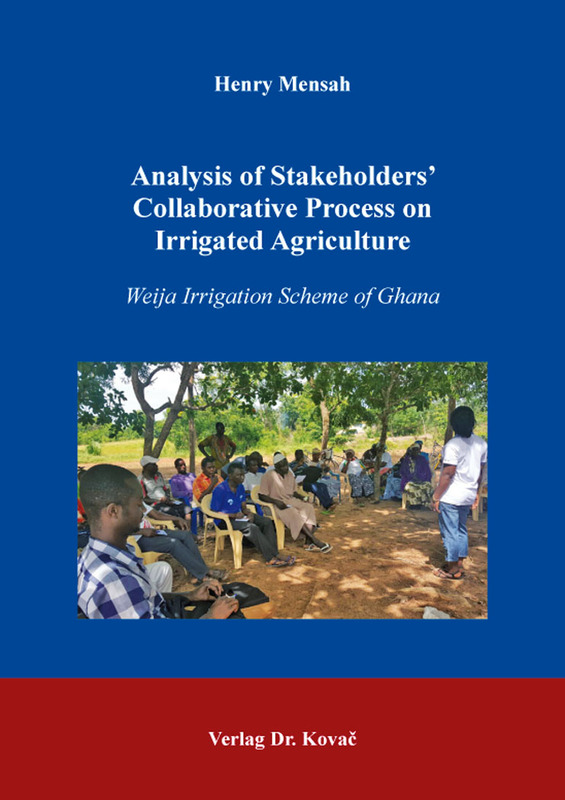 Analysis of Stakeholders’ Collaborative Process on Irrigated Agriculture. Dissertation von Henry Mensah, Verlag Dr. Kovač 2019, 200 S.
Bearing in mind the recent emerging issues in irrigated agriculture, organisations and research institutions are recognising the need to address irrigation problems through their staff and interventions. Thus, the complexity of emerging irrigation issues calls for close collaboration among relevant stakeholders. The purpose of this research was to identify best management practices that can guide irrigation stakeholders on how to collaborate effectively not only to achieve the desired policy change but also to provide adequate support services to irrigation farmers in Ghana. The research was conducted through face-to-face interview with heads of organisations, agencies, departmental heads, and extension officers. Also, questionnaires were administered to 151 irrigation farmers. The results were analysed to examine the nature and extent of stakeholders’ collaborative processes, benefits and outcomes of the engagement process on farmers and stakeholders’ relationship and irrigation management areas.